Sir Andy Murray admitted he did not immediately accept his knighthood due to concerns that it may have an adverse impact on his career. Murray was announced as the recipient of a knighthood in the New Year’s Honours list, capping his best year to date in which he won Wimbledon for a second time, retained his Olympic title and topped the world rankings for the first time. But at the age of 29, the Scot has plenty of time to add to his growing list of accomplishments and he briefly worried a knighthood may prove an unnecessary weight on his shoulders, after being informed by wife Kim via an email of the honour. Murray, who was on a training camp in Miami at the time, told the Times: “I got it when I woke up in the morning, just saying that I had been offered and (asking) would I like to accept. “I spoke to a few of the people closest to me. I didn’t have too long, but obviously you think about something like that because I do feel like it’s obviously a big honour, but with that comes maybe a little bit more responsibility. Murray accepted the knighthood after discussing the issue with Kim and mother Judy - although brother Jamie was not confided in and only found out on the night of the announcement. 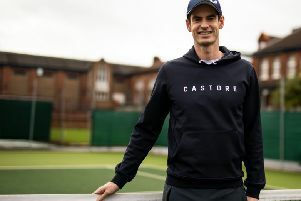 In a wide-ranging interview, Murray revealed he would like to explore coaching once he quits tennis - and has not ruled out an audacious move into football. He said: “Something within British tennis probably, potentially coaching another player. I would like to do something in football. I watch loads of it. I am into my fantasy sports a lot.